After gaining independence Azerbaijan have been carried out fundamental reforms in the law system of the country. Based on Azerbaijan nation's national, cultural and historical traditions, these reforms that minister to establish real democratic society directed to provide human rights more reliably. The third part of the constitution adopted in 1995 Year according to democratic values and principles dedicated to fundamental human rights and freedom and separation of the power. The constitution which estimated by international experts as one of the democratic constitutions of the world established democratic system and lawful state in Azerbaijan, created favorable chance for carrying out Judicial reforms. Because of Judicial reforms conducted by national leader of Azerbaijan - Haydar Aliyev, the judicial system that was heritage of Soviet Union fully reformed on democratic principles. As a consequence of the reforms new progressive legislations acts adopted as, "Constitutional court act", "Courts and Judges act", "Public prosecution act", "Police act", "Operational-investigational act" etc. and adopted acts totally differ from previous code of Civil, Civil Procedure, Criminal, Criminal Procedure, Execution of punishments. All these acts adopted on basis of democratic principles, met all requirements of international law and positively evaluated by international experts. As a result of the reforms established new 3-staged independent court system - The first degree of jurisdictional courts, courts of appeal and the Court of Cassation. At present, there are district (city) courts acts as the first degree of jurisdictional courts, military courts and local economic courts as territorial jurisdictional courts, also Court of Azerbaijan Republic on Felonies and Court of Azerbaijan on Grave Military Crimes. 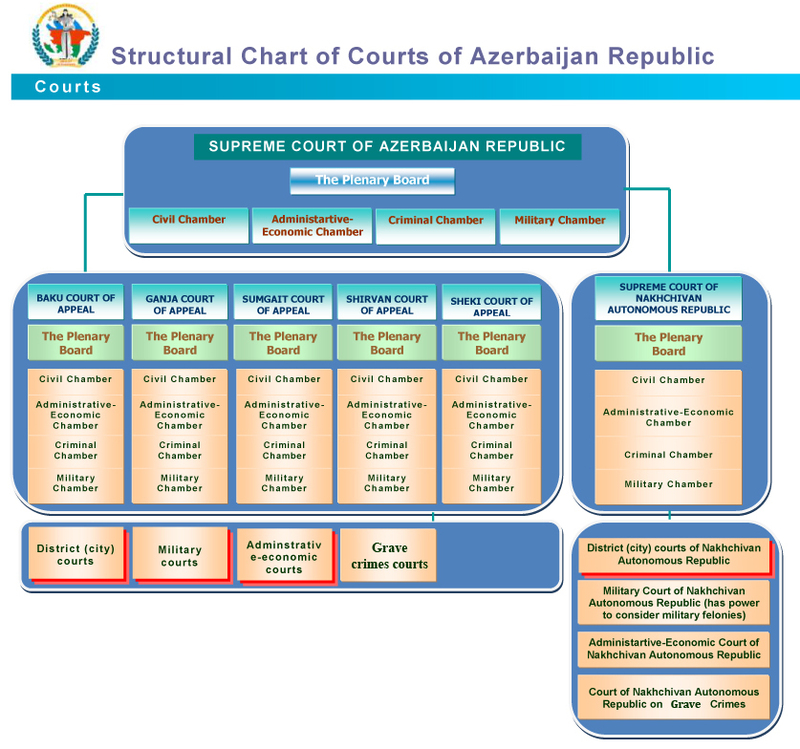 The Supreme Court of Azerbaijan Republic is cassational degree of jurisdiction and consists of 4 chambers - Civil Chamber, Criminal Chamber, Military Chamber and Administrative-Economic Chamber. The Supreme Court considers of appeal courts decisions in cassational order. Measures for development of judicial system in the country are always in order of the day. The President of Azerbaijan Republic Mr. Ilham Aliyev assigned Decree on January 19, 2006 year on modernization of Judicial system, so Judicial reforms in the country go on to the next phase by quality. According to the Decree, there were established new courts, also new appeal courts to rise up effectiveness of justice, access of the people to courts and for development of regions. Increasing number of Judges, modernization of court works, organization of newly established courts, improvement of works and structure of administrative body of courts and other duties are mandated by the Decree. 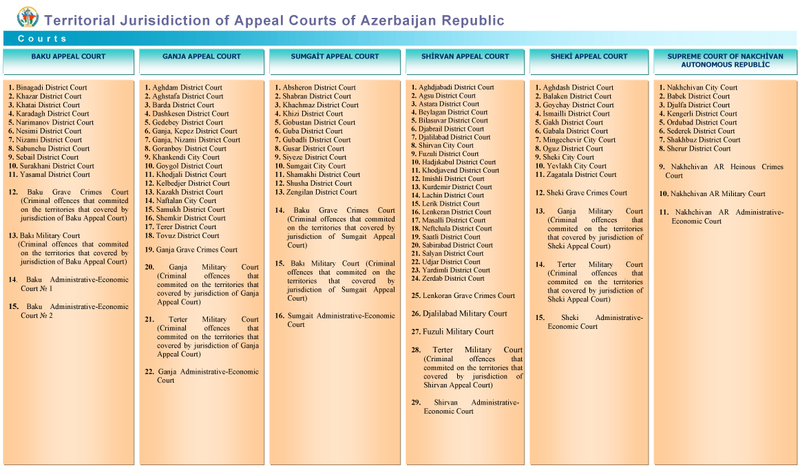 According to new Judicial, system there are appeal courts that carrying out its activity in 6 regions of Azerbaijan. Appeal courts are consist of 4 chambers - Civil Chamber, Criminal Chamber, Military Chamber and Administrative-Economic Chamber, and they carrying out their activity on territorial jurisdiction. When establishing Nakhichvan Autonomous Republic courts the siege, blockade situation (due to occupation of Daglig Karabakh by Armenian aggressors) of the territory was taken into account. As the Supreme Court of Nakhichvan Autonomous Republic is appeal instance for the first degree of jurisdictional courts and Court of Nakichevan AR on Felonies. However, the Supreme Court of Azerbaijan Republic is cassational instance for the Supreme Court of Nakhchivan Autonomous Republic. Constitutional Court of Azerbaijan Republic being as a supreme jurisdictional body provides the highest authority of the Constitution. Moreover, due to Law on Constitutional Court adopted 23/12/2003 year new mechanism of applying citizens to the Court on violation of rights determined. Within the measures rising effectiveness of the justice, adopted an Act on Courts and Judges, which was amended cooperating with Council of Europe and since 2005 year, "Judicial-Legal Council Act" became effective. Based on these acts that correspond to international principles established the Judicial-Legal Council which carries out functions of self-governing of Judicial power. Structure of the Council consists of 15 persons and 9 of them are Judges, others are representatives of the President, Milli Mejlis (Parliament), Office of Public Prosecutor, Bar, Ministry of Justice. Minister of Justice is now chairperson of the Council as member. In the new legislation immunity and term of appointment of Judges reviewed, termless appointment is fixed in the act, right of disciplinary proceeding regarding Judges given to the Judicial-Legal Council, a new establishment - the Judges Selection Committee founded by the Judicial-Legal Council to carry out selection of candidates for Judicial posts. At the same time there was established the Training Sector of Judges under the Council. Under the new method of Judges selection, first time in 2005 year carried out milti-phase exams on test, written and oral, long-term courses were held, high instance court Judges, legal scientists, expert jurists, also prominent experts form Turkey, CE Commissioner for Human Rights, Judges of European Court of Human Rights, European Common Law Centre and ABA/CEEL are being involved to the courses. In total, during 3 selection processes more than 2100 candidates participated in selection exams and 157 of them appointed to Judicial posts. Special support given by international financial groups to the Judicial reforms that carried out in the country. Because of reforms in Judicial field the World Bank has estimated achievements and with cooperation of the Ministry of Justice leadership launched joint-project named as "Modernization of Justice sector". 18 new court building will be erected and in general, judicial infrastructure will be renewed, up-to-date technologies will be employed. According to the Judicial reforms conducting in the country the branch of the judicial power - public prosecution role completely renewed, its activity adapted to international norms and requirements of democratic institutions. As, after adoption of "Public prosecution act" in 1999 year some competences of public prosecution were cancelled, like general warrant competence was given the courts, supervision over courts was abolished. At the present, the Public Prosecution of Azerbaijan Republic as being independent body commences investigation on crimes, guides to the preliminary investigation, does public prosecution, and represents itself as claimant on behalf of the state in civil issues. For democratical modernization of the Bar and improve system of legal aid, new act of "Advocates and advocacy" adopted in 1999 year.